Is this Bane's ultimate weapon from The Dark Knight Rises? Have set photos revealed the device that Bane will use to bring Batman to his knees in The Dark Knight Rises? Possibly — a collection of photos and blueprints may have just revealed Bane's dastardly plan for the good people of Gotham. A while back Bane was filmed blowing up a Gotham Rogues football game in Chris Nolan's final Batman movie. After his grand entrance, the villain then took the mic and yelled to the crowd, "Gotham. Take Control! Take Control of your city. This! This is the instrument of your liberation. Why don't you identify yourself to the world?" 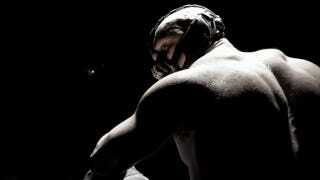 Then he allegedly rolled out a massive device that we all assumed was the "instrument" Bane was ranting about. Now, thanks to set photos Superhero Hype and blue prints from The Dark Knight Rises Community, we think we've discovered what this weapon can do. First up here's an image of the device. And picture that shows the Batman hovering in his Batwing over the circular contraption, treating it the same way you would a bomb. Bat-Bomb Squad to the rescue?. Ben Solis at The Dark Knight Rises Community posted a few rumored blueprints of the bomb, which seem to indicate that it's really just a giant EMP device. Apparently Bane wants to free us from our smart phones. Here's the run-down on the bomb, which others have pointed out is similar to the Microwave Emitter that Ra's Al Ghul used in Batman Begins to poison Gotham. The George-Greenhouse 225kt device "used a hollow cylinder of TNT (8 feet in diameter and 2 feet thick) to compress a cylinder of oralloy (Oak Ridge alloy, highly enriched uranium-235) in the middle. This was done to expose the bare ends of the uranium cylinder to get unshielded radiation from it, without the intervening TNT-shielding you would get if you compressed a sphere of plutonium using a sphere of TNT around it. Although the unshielded radiation from the fissioning core was used for experimenting with nuclear fusion in the Greenhouse-George test, such systems also obviously maximise prompt gamma ray output IN A PREFERRED DIRECTION AS AN EFFICIENT 'DIRECTED ENERGY' EMP DEVICE." So, what do you think? Will Bane's war on technology get you excited? Or is any new Batman villain doomed to live in The Joker's shadow forever? The Dark Knight Rises hits theaters on July 20, 2012.